As employment growth in Melbourne’s CBD continues to rise, the next generation of workers are demanding more from apartment developments close to their employers. New research commissioned by MAB Corporation, which included a survey of Australians about their property and lifestyle preferences was completed by Pure Profile, reveals that young apartment hunters not only want to be positioned close to work, but almost two-thirds are seeking affordable options with spacious floorplans. According to MAB General Manager of Residential David Allt-Graham, the influx of young professionals in the Docklands area in particular is driving demand for more youthful apartment developments in the area which offer these features. Recent Melbourne City Council data reveals the number of jobs in the municipality has increased by 33 per cent in the past decade. 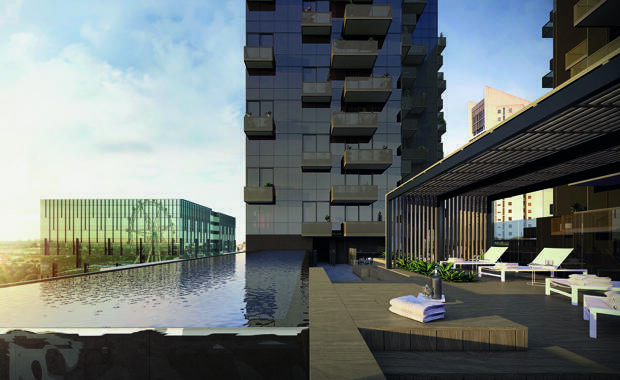 The response to this rising demand has been Elm & Stone, a development created by MAB Corporation and DKO architects. Elm & Stone is one of the first genuine loft developments to be built in Melbourne and offers buyers the choice of either one or two bedroom lofts alongside traditional one, two or three bedroom apartments or its three-level townhouses. “We prototyped multiple variations of this design to deliver the height and space that you might find in a converted warehouse, whilst capitalising on the great design benefits, of secure, elevated, north facing, apartment living,” said Mr Allt-Graham. The $150 million development boasts a selection of purposely built, industrial style loft apartments whose designs maximise height and space and utilise a split level to create a flexible mezzanine space that could be used as a living area, children’s play space, extra bedroom or studio. Mr Allt-Graham said Elm & Stone will complement MAB’s existing developments at NewQuay, the mixed-use Docklands precinct it has been developing over a decade. “MAB’s vision is to turn NewQuay into a space where people love to live, work, play and visit,” he said.